This 12-Outlet Horizontal Power Distribution Units (PDU) is a UL listed surge protected power strip with EMI/RFI protection built-in. 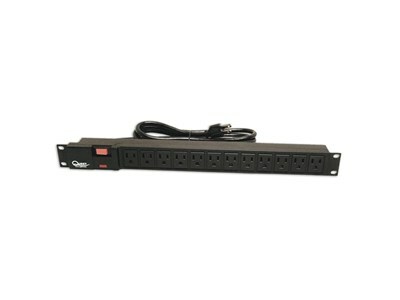 It has (12) 120VAC/15A outlets on the front, and is constructed with a 6ft. swivel power cord with a standard 3-prong plug, and a safety switch guard to protect inadvertent tripping of the on-off switch. It is ideal for use in both floor enclosures and open frame racks, comes standard with removable vertical mounting brackets and has a black microfinish to match rack and enclosure color.